Stormwater management regulations are a major requirement of construction projects across the country. From rainwater harvesting in Santa Monica to projects in my backyard in the D.C. metropolitan area, these requirements drive the design of projects and are certainly impacting everything from development costs to site layout. Several weeks ago I visited a multi-family development in Northern Virginia along with the Stormwater division of Oldcastle Infrastructure, A CRH Company. We observed the installation of a StormCapture® modular underground detention system. StormCapture® is unique in the industry in that it blends the high performance and efficiency of precast concrete with modular construction technique to bring maximum value to the contractor and end user. Click here to learn more. During this site visit, I had the opportunity to talk with representatives from Oldcastle Infrastructure about stormwater management and what the drivers are for regulations in the D.C. Metropolitan area. Q: What do you see as major challenges that developers and engineers face as they look for stormwater management solutions on their particular projects? One of the biggest challenges for developers is how to make-do with the available land to develop. For certain reasons these projects have not been developed because of wetland issues, stream impacts, utility easements, pipelines, grades, etc… With that being the case, Stormwater Management restrictions have been elevated over recent years which has compounded the development challenges with available properties. For example, the project we are on today had a major pipeline challenge that had to be overcome. Directly to the right of the structure runs the four natural gas lines that supply the entire Northeast. During the install of this StormCapture system, teams had to be cautious of natural gas lines running nearby. Q: Why is stormwater management such a big issue? 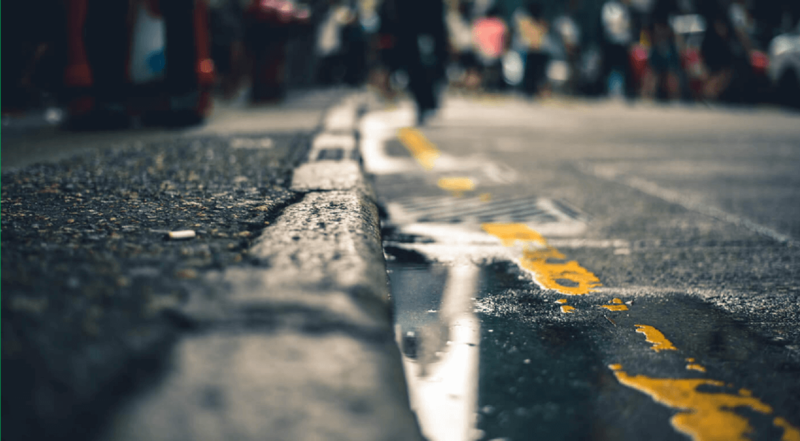 As increased urbanization has occurred, paved areas have increased peak flows which have necessitated stormwater controls for quality and quantity. On top of this, because of the amount of stormwater management required per site, it is often one of the first things considered when conceptual plans are developed. This is a major driver for project cost in our region. 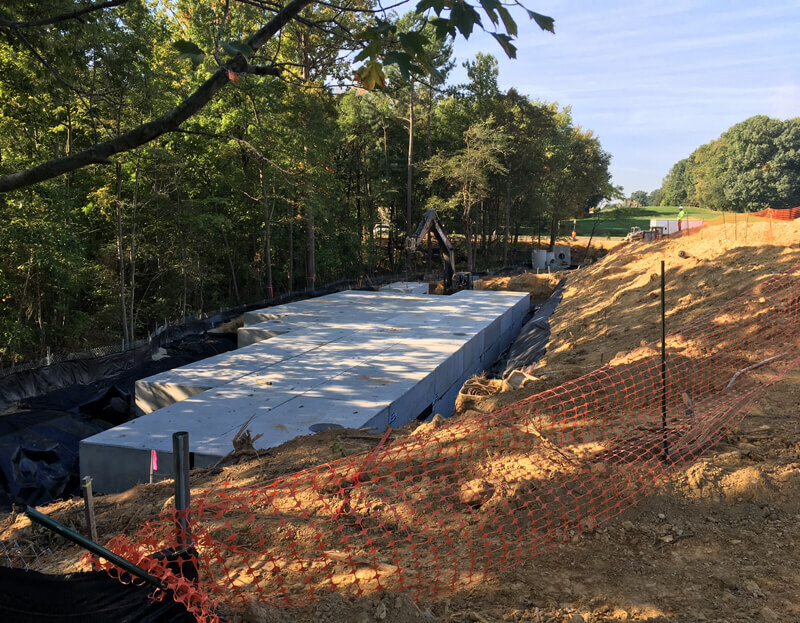 For example, in Montgomery County, MD, stormwater management controls could equate to ¼ of the cost of a typical site package for a project. Q: How have you seen the regulations change over the past 5 years? In the past 5 years we have seen a focus from regulatory bodies mandating low impact development, also known as environmental site design. Before that there was a shift to underground and centralized large facilities to maximize site flexibility. LID/ESD (Low Impact Development/Environmental Site Design) encourages the use of dispersed landscape solutions that occupy a lot of site area. This has caused Stormwater Management to become even more critical as part of the site design. An unintended effect has been an increased cost to manage stormwater onsite. Q: Where do you see regulations moving in the next 5 years? Expect continued emphasis on the LID/ESD, however the available tracts of land in this area do not always support this approach. A new approach will require more creativity moving forward using alternative solutions such as structural solutions, underground systems and nutrient credits. Q: What do you see as the major challenges for GCs and Subs as they incorporate the various stormwater management systems into their projects? The biggest challenges for GCs and Developers is that now stormwater management is an established business. There are now multiple parties vying for work and the most cost effective solution is not always the best solution due to the complexity of the site package. Civil Engineers have very little time to vet multiple stormwater options during design and quite frequently will use the same design, even if it is not the best option from cost, site installation and long term performance perspective. Q: What solutions do product manufacturers offer that can set them apart from the competition? Most manufactured treatment for underground systems are marketed and sold by a company and manufactured by a third party. Building Solutions has the ability to do all of these aspects in house, which provides greater value to the project team for the life of the project. In addition to offering proprietary manufactured systems, Building Solutions can produce systems that meet the standard designs set forth by the regulatory agencies. This provides Civil Engineers more tools and resources to meet challenging site requirements such as our BioMod® precast bioretention planters and StormCapture detention systems. Q: When is the best time for product manufacturers to get engaged on projects in which there are stormwater challenges? As early as possible. Quite frequently, Building Solutions is brought in very early on a project to help the Civil Engineer and Developer to determine the feasibility of the project. Likewise we have been able to work with General Contractors and Site Contractors late in the game to provide Value Engineering options to help resolve complex site challenges. Q: Can you share a recent success story on how your early involvement leads to a project solution? The project we are on today had a significant challenge and incorporates the StormCapture system. Through a previous relationship with the Owner and Civil Engineer, the Building Solutions worked directly with the team to come up with a unique design to resolve a significant challenge associated with an adjacent pipeline. This pipeline runs directly through the site and precluded the use of many of the available options in the market. 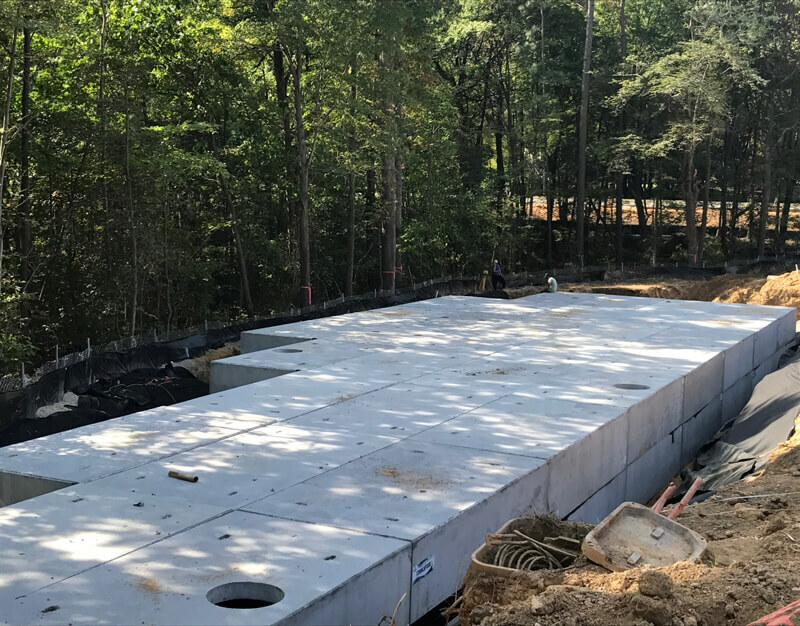 The StormCapture system was designed to sufficiently hold the required storage volume while also fitting snugly between the utility easement and property line. See how bringing the product manufacturer in early can help ensure your project starts on a solid foundation. 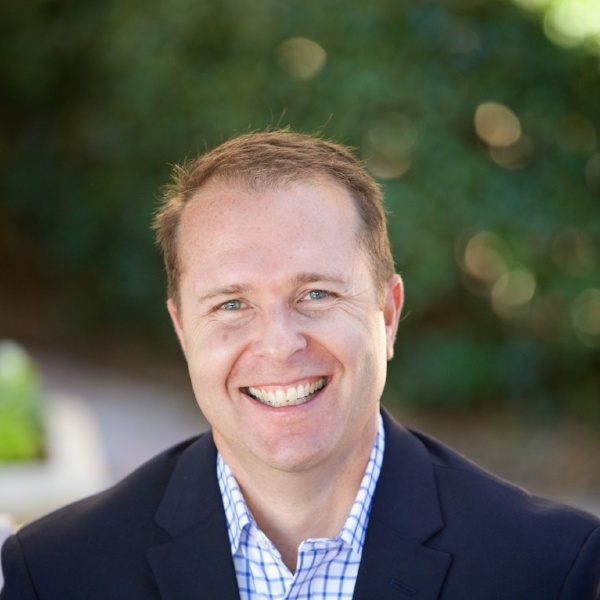 Craig Kennedy is the Director of Business Development for Maryland, Virginia, West Virginia, and Washington D.C. He educates the architectural and development communities on the wide range of products CRH manufactures and key relationships that can help construction professionals get their job done. Craig is a graduate of the University of South Carolina, with a B.S. in Civil Engineering and a Graduate of North Carolina State University with an M.S. in Construction Management. Prior to his time in the commercial industry, Craig served his country as a Civil Engineer Corps Officer in the United States Navy.